RasGas Company Ltd (RasGas) is one of the world’s premier integrated LNG enterprises. Since its creation in 1993, RasGas has developed world-class facilities for the extraction, storage, processing and export of LNG, and has entered into long-term agreements to supply LNG to customers in Korea, India, Italy, Spain, Belgium, Taiwan and the Americas. RasGas has seven LNG trains in operation, with a total production capacity of approximately 37 million tonnes of LNG per year. QAFCO was founded in 1969 as a joint venture between the Government of Qatar and a number of foreign shareholders. The country's first large-scale venture in the petrochemical sector, QAFCO was established with a view to diversify the economy and utilize the nation's enormous gas reserve. After successfully implementing several expansion projects over the past three decades, the Company has evolved into a world-class fertiliser producer. QAFCO is now owned 75% by Industries Qatar (IQ) and 25% by Yara Netherland. 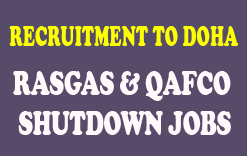 Candidates must be ITI & earlier worked with QAFCO, RASGAS, QATARGAS, DOLPHN & QP.